The Best Canadian Political blogs from thousands of top Canadian Political blogs in our index using search and social metrics. Data will be refreshed once a week. Ottawa, ON, Canada About Blog iPolitics is independent, non-partisan and committed to providing timely, relevant, insightful content to those whose professional or personal interests require that they stay on top of political developments in Ottawa and the provinces. iPolitics.ca provides Canadian politics at your fingertips. Facebook fans 15,179. Twitter followers 71,940. About Blog Rabble.ca was built on the efforts of progressive journalists, writers, artists and activists across the country and has a unique role of reporting on stories from civil society while providing a counter balance to corporate-owned media. It provides a needed space for issues, a place to explore political passions and an opportunity to expand ideas. Facebook fans 20,236. Twitter followers 40,495. Ottawa, ON, Canada About Blog The Hill Times, Canada’s politics and government newsweekly, the coverage of Canadian federal politics and government forever. Find Breaking exclusive stories and blazing trails every week, they’re an influential must-read for the savvy political and government insider. Facebook fans 5,670. Twitter followers 86,610. About Blog All the Canadian Politics is about Canadian Politics, News & Social Justice. This blog is left leaning politically. Facebook fans n/a. Twitter followers 2,071. About Blog National Newswatch is Canada's most comprehensive site for political news and views. Facebook fans 8,054. Twitter followers 43,997. Canada About Blog Loonie Politics is a trusted news source that selects the must read daily political stories and analysis on line and provides a view of the Canadian political landscape in one location. Facebook fans 1,076. Twitter followers 34,451. Canada About Blog Samara Canada is dedicated to reconnecting citizens to politics. Samara Canada’s research and educational programming shines new light on Canada’s democratic system and encourages greater political participation across the country to build better politics, and a better Canada, for everyone. Facebook fans 3,570. Twitter followers 30,333. Canada About Blog The Official website of New Democratic Party of Canada. And about their Fight for fairness and results. Facebook fans 115,393. Twitter followers 189,796. About Blog Progressive Bloggers is a group of Canadian bloggers who firmly believe that this great country needs to move forward, not backwards. Be they Liberal or liberal, New Democrats or democrats, Green voters or voters who want a green country, or even Red Tories searching for a home, these bloggers believe that Canadian politics should move in a progressive direction. About Blog Reddit is a community of millions of users engaging in the creation of content and the sharing of conversation across tens of thousands of topics. A sub-reddit for polite discussions about Canadian politics. Facebook fans 1,187,282. Twitter followers 544,555. Canada About Blog Discover the Liberal Party of Canada and learn more about their vision for real change in Canada. Facebook fans 307,104. Twitter followers 252,447. Edmonton, Canada About Blog Daveberta.ca was launched in January 2005 and quickly became one of the best read political blogs in Alberta. Dave is a writer and political watcher. Facebook fans 3,016. Twitter followers 16,170. Facebook fans n/a. Twitter followers 6,286. Ottawa, ON, Canada About Blog The Canadian Progressive is a hard-hitting, provocative, unapologetic, activism-oriented political blog. They provide you with hard-hitting, controversial, insightful, thoughtful, provocative and progressive ideas on Canadian and global politics, institutions, rights, policies, systems, values, culture and diversity. Facebook fans 1,462. Twitter followers 466. About Blog FactsCan is an independent and non-partisan fact-checker on Canadian federal politics. We inform Canadians to critically engage in political discussions, and encourage politicians to be honest and accurate with their words. Facebook fans 3,771. Twitter followers 2,516. About Blog Reddit is a community of millions of users engaging in the creation of content and the sharing of conversation across tens of thousands of topics. A sub-reddit for news items and discussion related to politics in Canada. Primarily national, but provincial, regional, and local as well as party stuff and things of historical interest. Facebook fans 1,187,281. Twitter followers 544,555. Canada About Blog Maclean's is Canada's only national weekly current affairs magazine. Maclean's enlightens, engages, and entertains 2.8 million readers with strong investigative reporting and exclusive stories from leading journalists in the fields of international affairs, social issues, national politics. Facebook fans 161,475. Twitter followers 402,180. Canada About Blog OpenCanada.org is a publication of the Canadian International Council, the Centre for International Governance Innovation and the Bill Graham Centre. They produce multimedia content to explain, analyze and tell stories about the increasingly complex and rapidly shifting world of foreign policy and international affairs. Facebook fans 6,755. Twitter followers 13,475. Canada About Blog The Angus Reid Institute is a national, not-for-profit, non-partisan public opinion research foundation established to enhance and encourage better understanding of issues and trends affecting economic, social, governance, philanthropy, public administration, domestic and foreign policy in Canada and its world. Facebook fans 1,048. Twitter followers 5,993. Winnipeg, Canada About Blog Canadian Dimension is a forum for debate on important issues that face the Canadian Left today, and a source for national and regional politics, labour, economy, world affairs and art. Facebook fans 4,606. Twitter followers 2,754. About Blog The Broadbent Institute is Canada’s leading progressive, independent organization championing change through the promotion of democracy, equality, and sustainability and the training of a new generation of leaders. Facebook fans 38,390. Twitter followers 23,363. Canada About Blog The Canadian Nationalist Party is a federal political party advocating strong national identity. Facebook fans n/a. Twitter followers 172. Canada About Blog Equal Voice is a national, bilingual, multi-partisan organization dedicated to electing more women to all levels of political office in Canada. Equal Voice regards the equal representation of women in Canada's Parliament, in our provincial legislatures, and on municipal and band councils, as a fundamental question of fairness for women in terms of their access to Canada’s democratic institutions. Facebook fans 6,410. Twitter followers 13,597. Toronto, Ontario About Blog On procedure and politics focuses primarily on aspects of parliamentary procedure, parliamentary government in general and politics in a very general sense. Facebook fans n/a. Twitter followers 1,227. About Blog EKOS Politics updating this site frequently with new polls, analysis and insight into Canadian politics. EKOS's experience, knowledge and sophisticated research designs have contributed positively to many previous elections. About Blog ThePolitic.com is a Conservative group weblog that publishes daily commentary on political events and topics affecting Canada, the United States and the world. Toronto, Ontario About Blog Mind Bending Politics is an Independent Mind Bending Political Blog Focusing on Canadian Politics and Policy. Facebook fans n/a. Twitter followers 3,469. About Blog Tracking the Politics of Criminalization and Punishment in Canada provides commentary that aims to make sense of recent developments in the politics of criminalization and punishment in the Canadian context. Facebook fans 1,777. Twitter followers 245. About Blog Greg Fingas is a Regina lawyer, blogger and freelance political commentator who writes about provincial and national issues from a progressive NDP perspective. Facebook fans n/a. Twitter followers 1,648. Ottawa, Ontario About Blog Earl has a BA from Carleton University in Political Science with a concentration in Canada politics. He concentrates his contributions to Canadian politics, and his passion of curling. Most Canadian election maps on Wikipedia were uploaded by him (User:Earl Andrew). His interest in politics and cartography has led him to create this site. About Blog FY Canadian Politics is a blog dedicated to the horrifying world of Canadian Politics. About Blog Joerge Dyrkton attended Trent University in Peterborough, Ontario where he graduated with an Honours B.A. in History. This blog is his thoughts on Canadian Political Culture: Criticisms, Reviews and the Poverty of Parliament. 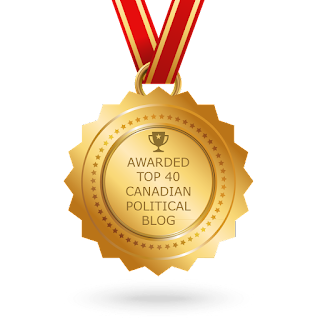 CONGRATULATIONS to every blogger that has made this Top Canadian Political Blogs list! This is the most comprehensive list of best Canadian Political blogs on the internet and I’m honoured to have you as part of this! I personally give you a high-five and want to thank you for your contribution to this world.